Technology can be found in every aspect in our daily lives: work, play, communication, transportation, health/wellness, safety, and more. How does technology respond to our interactions in the physical world and what happens “behind the scenes” with our favorite devices? 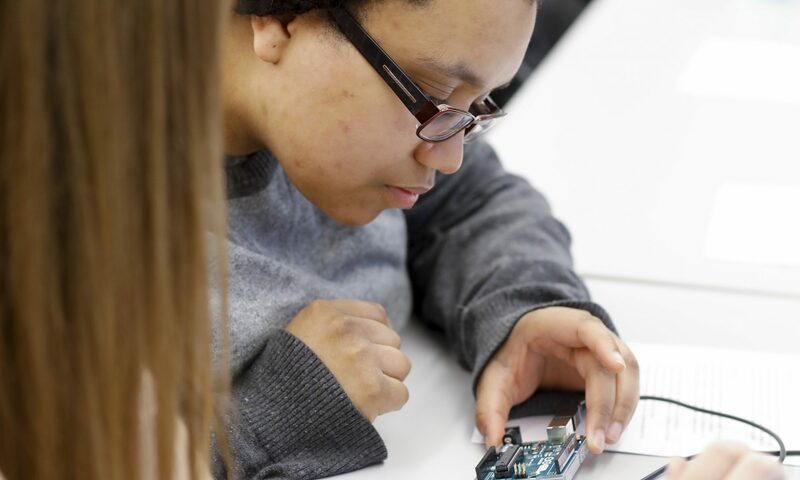 In this session, we will discuss the concept of input and output, introduce students to a variety of hardware, and have everyone program microcontrollers to put these concepts into practice. In this workshop, we will use Python to create music on a platform called EarSketch. EarSketch (https://earsketch.gatech.edu) allows you to compose music by coding in Python programming language. We will first introduce the EarSketch program and its workspace and built-in tools as well as Python terminology and tools. Then, we will compose music! We will also explore different ways to expand and improve our codes, using a range of computational concepts including looping, functions, and data types. Algorithmic decision making systems are pervasive in business and culture, and have a general reputation as bias-free, even-handed decision makers. However, all algorithms have embedded biases, and these biases have real-world consequences. It is not impossible to identify and mitigate algorithmic bias. This workshop is an introduction to algorithmic bias, where it comes from, how to identify it, and how solutions to these problems will take cooperation and understanding between those charged with engineering the systems and those with the knowledge of culture, society, law, and ethics. Communication Studies students should be able to leave this workshop with enough general understanding of the concepts and jargon used with algorithms as well as their cultural and social impact to feel confident that they can successfully collaborate with software engineers to mitigate biases or even go on to learn how to engineer these systems themselves.